(Bloomberg Opinion) -- Donald Trump’s presidency encourages a kind of policy sloth. Because Trump knows practically nothing about policies, including his own, and lies about them regularly, there is little to be gained from debating him publicly or negotiating with him privately. If Democratic leaders do work out an agreement with the White House, it’s liable to be tossed aside if Trump gets spooked by his base. Last year, with Republicans in charge of Congress, Trump rejected numerous offers for a border wall, with $20 billion or more in funding, in return for providing a path to citizenship for Dreamers, the undocumented immigrants brought to the U.S. as children. The $20 billion figure was quite large; Trump is currently demanding $5.7 billion. Releasing the Dreamer hostages was a top Democratic priority, and Democrats were willing to pay a heavy price for it. However, Trump’s most virulent supporters generally want to deport Dreamers, who are mostly nonwhite. So Trump bailed. Democrats will never again offer Trump $20 billion for his signature initiative; the politics have changed. Trump made anti-immigrant demagogy the centerpiece of last November’s midterm election. Republicans got clobbered, losing 40 House seats. The president’s job-approval rating, never high, has been edging lower over the course of the government shutdown that he deliberately engineered, claimed credit for and then blamed on Democrats. So far, the only thing the wall is protecting are Democrats, who feel little pressure to do anything but await Trump’s surrender. The pragmatic arguments that Democrats once made against a wall – it’s ineffective, expensive, impossible in some places due to terrain or private ownership, plain stupid – are increasingly shelved. Republican leaders apparently concur. This week, for the first time, they took punitive action against Representative Steve King of Iowa for his racist provocations, which began many years before 2019. With Trump in the lead, the GOP fears being seen as racist. And with the Republicans’ nativist base empowered, the party also fears being seen as not racist enough. Thus a smack for King, a hug for Trump. Yet when the shutdown, and the symbolic skirmish behind it, ends, the immigration debate will not. And it’s unclear how much progress Democrats will have made persuading distracted voters to embrace a realistic and humane alternative to Trump’s fantasy and aggression. Trump is not winning the fight overall. A Pew Research Center survey this month found 58 percent of Americans oppose “substantially expanding” a wall on the U.S. border with Mexico, while 40 percent support it. But Trump has succeeded in further polarizing the debate on partisan lines, with more Republicans now supporting a wall and more Democrats opposing one. To a president under rising pressure from the law, whose lifeline is partisanship, that’s a silver lining. As to the substance, will Americans who have been encouraged to imagine an impregnable curtain of steel be better able to imagine the legal and topographical fiascos that would ensue from trying to build it? Or the handmade wooden ladder that would be used to vault over it? What about a comprehensive alternative that includes a path to citizenship for the undocumented and tighter controls on borders and employment? It was a lie, naturally. Clinton never supported “open borders” – whatever that even means in a nation with a militarized border zone, long delays at key crossings and a Border Patrol of more than 21,000 agents. Her campaign website included the boilerplate assertion that, as president, she would “protect our borders and national security” (though her immigration section was otherwise uncharacteristically spare). Yet when Trump attacked, Clinton didn’t effectively counter. Granted, responding to every Trump lie would exhaust any human. But this particular charge was made in a nationally televised presidential debate. It merited a firm response then. And since Trump continues to make the false charge about Democrats generally, it merits a firm response today. 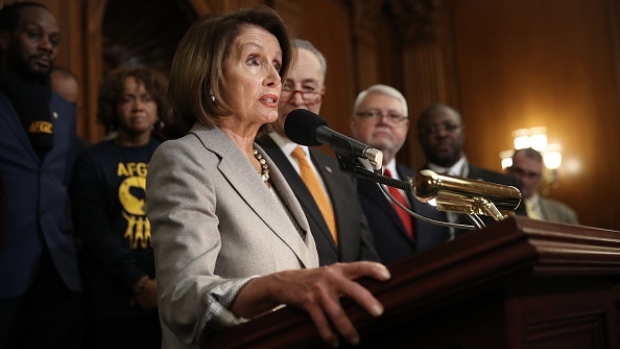 Last week, Pelosi suggested that a “technological wall” would better suit the demands of border security. The phrase, a vaguely familiar, and familiarly vague, one repeated through the years, at least connotes that Democrats are committed to security. That Pelosi and Clyburn aren’t even using the same lingo suggests that Democrats could stand to clarify their approach. If something happens that Trump and Fox News can exploit – a clash at the border, a killing by an undocumented immigrant – increased clarity may come in handy. Six years after the Senate passed a comprehensive bipartisan immigration package with more than two-thirds of senators voting in favor, the basic outlines of a compromise haven’t changed all that much: large-scale legalization of long-resident undocumented immigrants and rationalized legal immigration, including temporary work visas, in return for heightened border security and a systematic crackdown on employers who hire undocumented workers. In addition, owing to the changing nature of the challenge, a robust regional plan to improve security in Central America will be necessary. There’s no room for a symbolic wall in that basic formula. But that doesn’t mean Democrats should assume that everyone knows why.